Education Minister John O'Dowd during a visit to Holy Trinity Primary School last month. 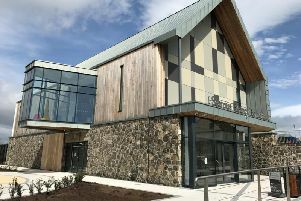 A decision on a shared education campus in Cookstown is expected in June this year, the Education minister has revealed. The proposal for the shared campus includes Cookstown Primary School and Holy Trinity Primary School supported by Phoenix Integrated Primary School. In a statement Mr O’Dowd said he welcomed the interest shown by a further six projects across Northern Ireland, involving more than 20 schools, to the second call in the Shared Education Campuses Programme. The Shared Education Campuses Programme was launched in January 2014. Three projects were successful in the first call to progress to business case stage. A second call for expressions of interest opened on 1 October 2014 with a deadline of 30 January 2015. Welcoming the interest shown in the programme, the Minister said: “Shared education has the potential to deliver real educational benefits, to ensure best use of resources and to further community cohesion. “This Programme provides schools with the opportunity to build on existing sharing arrangements and access funding to help improve or provide shared facilities. “I thank everyone involved in submitting their applications, which include four applications from the previous call. “The proposals will undergo feasibility studies and economic appraisals with funding subject to agreement on access to required capital funding.